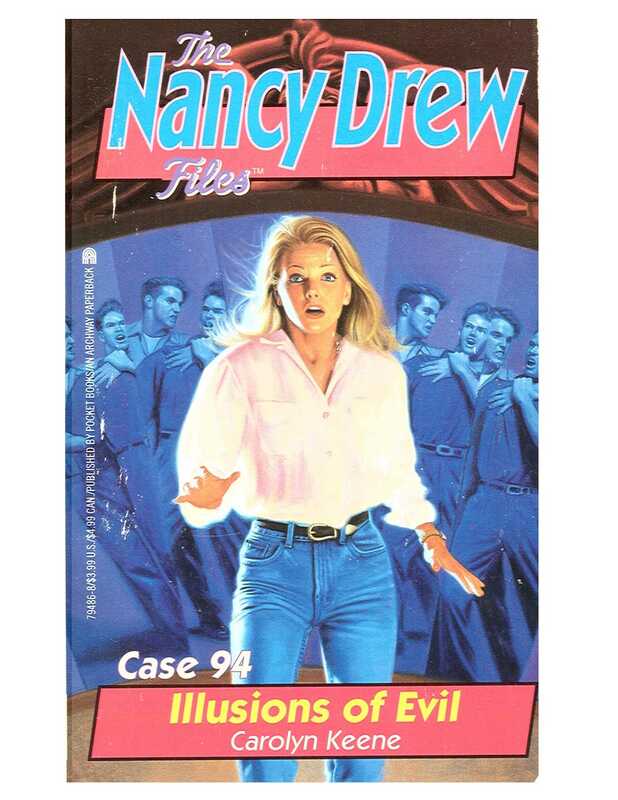 Nancy has come to Riverfront amusement park at the invitation of famed illusionist Adriana Polidori. Having inherited the park after her uncle’s tragic death, Adriana has found herself on a rollercoaster ride of terror. For Riverfront has suddenly been transformed into a world of delusion, deception, and potential disaster! The danger begins with the sabotage of Adriana’s magic act and quickly spreads throughout the complex. Squeals of joy turn to shrieks of fear as the park’s rides spin out of control. To rescue Riverfront, Nancy knows she’ll have to work some magic of her own. A dirty trickster is on the loose, bent on making Adriana disappear…permanently! This is going to be awesome!" Ned Nickerson exclaimed. "I get to spend my ten days of spring break with my girl, and the very first night she gets free tickets to Riverfront Park!" Ned leaned across from the passenger seat of Nancy's blue Mustang and wrapped Nancy in a hug. "Boy, did I miss you!" "Same here, Nickerson," Nancy said, resting her head briefly on his shoulder. "It's been too long," Ned murmured into Nancy's ear. George Fayne coughed pointedly from the back, where she sat sideways, her long legs stretched out across both seats. "Save the lovey dovey stuff for later, okay? We have to get to Adriana's show." "Right," said Nancy. sitting up and starting the car. "I can't believe Adriana Polidori is one of your father's clients," Ned said as Nancy pulled the Mustang away from the curb. "She's one of the most famous magicians in the world." Nancy, Ned, and their good friend George were headed for Riverfront Park, an amusement park just south of Conklin Falls, about twenty miles from River Heights, where George and Nancy lived. The free passes had arrived at Carson Drew's law office, compliments of Adriana Polidori herself. "I'm still surprised that Adriana decided to take over the park after her uncle Nicos died last fall," Nancy commented. "Dad says she plans to give up touring and settle down here for good." "It does seem like an odd career move," Ned agreed. "I don't know about that," George said. "Re member when we went to that rock concert at the park last summer? The auditorium is huge -- it would be perfect for a magic show. Besides, what magician wouldn't want her own stage, where she could permanently rig up equipment for really spectacular illusions?" Nancy drove out of town and got on the parkway headed north toward Conklin Falls. During the ride, she and George caught Ned up on what had been going on in River Heights, including how Nancy had gotten involved in a big murder case while serving as a volunteer at the city's teen center hotline. Ned was a student at Emerson College, a two-hour drive from River Heights, so he and Nancy didn't get to spend much time together during the school year. Nancy stole a glance at Ned. It was such a treat having him there! She couldn't help sighing. Ned caught her gazing at him and chastised her gently. "Keep your eyes on the road, Drew." Nancy grinned and rubbed Ned's arm playfully. "Don't kid yourself. You're not that distracting, Nickerson." "Hey, look," George broke in, pointing up ahead. "Talk about spectacular!" From the parkway exit ramp, they could see the lights of the amusement park glittering against the clear early-evening sky. As Nancy turned onto the road that led toward the Muskoka River, she spotted the roller coaster, Ferris wheel, and parachute jump. "I can't wait!" George cried. "I'm going on the roller coaster. And I'm going to eat cotton candy until I'm stuffed. Who's up for it?" "But not until after the magic show," Nancy added. "Well, sure," said George. "We can't miss Adriana's act." Soon they were driving through the gates of Riverfront Park. The parking lot was jammed. Even on a chilly Tuesday evening in April, Adriana was attracting a sizable crowd. "Isn't it a bit early in the season to open an amusement park?" George asked. "Actually, the grand opening isn't until the beginning of May," Nancy explained. "These first few weeks are sort of a dress rehearsal. My dad said Adriana wants to try out her new act on an audience to work out the bugs. She also decided to open a number of the rides and attractions, but she won't have everything up and running until May." Nancy found a parking place at the far end of the lot. The three of them got out, then Nancy locked the car, and they headed for the entrance. They showed their passes to the man at the booth, then joined the crowd along the midway. It was a beautiful evening but definitely chilly. Nancy was glad she'd worn her leather bomber jacket, jeans, and a sweater. Ned wrapped an arm around her shoulder, and Nancy smiled up at him. "Don't you love this old place?" she asked. The midway was a broad, gravel-covered walk way that ran from the entrance to a plaza perched high on the cliffs above the river. It twinkled with festive lights and was lined with dozens of game and refreshment booths. Barkers called to Nancy and her friends from the booths, challenging them to win prizes by tossing rings or shooting duck decoys or ringing a bell with a whack of a sledgehammer. The brightly lit rides surrounding the midway whirled against the dark sky. Nancy noticed a line at the Ferris wheel and could hear joyful, giddy screams from the cars suspended high above her. Raucous music filled the air, making her head spin. "You bet I love it," Ned said. "I remember coming here when I was a kid. I'm glad Adriana is going to keep it open." "I just wish Bess were with us," George lamented, running a hand through her short brown hair. Bess Marvin was George's cousin and the girls' best friend. "Maybe she'll go to a theme park while she's in Florida with her family," Nancy said. "Maybe. But only Riverfront has the Typhoon," George declared. She gazed longingly at the big roller coaster as they walked by. Its towering latticework of steel beams supported tracks that twisted and dipped like the rings of intertwined pretzels. As two trains of four cars each plummeted down the steep hills, the riders on the Typhoon shrieked and raised their arms straight over their heads. Nancy could sense Ned and George's excitement as they watched the cars sail by. She checked her watch and said, "Ten minutes until Adriana's show. You guys will just have to wait to ride the Typhoon." George seemed to be dejected for a moment, but then her expression brightened. "All right! Let's get going or we might miss her act." They found a sign for the auditorium and hurried in that direction. The crowd thickened as they neared the huge brick and glass building. Above the entrance was a marquee. Appearing Tonight: Adriana Polidori, the World's Greatest Illusionist, its bright lights announced. Ushers guided Nancy and her friends into the auditorium and to their seats in the second row. Heavy blue velvet curtains hid the stage, and the audience around them buzzed, anticipating the show. Soon the lights dimmed, and out of the darkness the beam of a single spotlight hit the curtains. Then a violin played a haunting gypsy melody. The curtains parted just enough to allow a solitary figure to pass through. Adriana Polidori stepped into the spotlight, to the wild applause of the audience. Ned leaned over to Nancy. "I guess everyone's as excited as we are to see Adriana in person," he whispered. Nancy studied Adriana as she held up her hand to silence the crowd. She was in her midthirties, a tall, strikingly beautiful woman with dramatic features and thick jet black hair. She wore an elegant floor-length black gown with a halter neck and long black gloves. "I guess we can be pretty sure that she doesn't have anything up her sleeves," George joked. Now the audience hushed, and Adriana leaned toward them, a mischievous gleam in her startling green eyes. She gestured sinuously with her hands and arms, drawing them in. "Good evening, ladies and gentlemen," she said, her voice a whisper picked up by a microphone Nancy knew was hidden on her costume. "Welcome to my new home. Riverfront Park was my home once before, when I was a little girl, and it was here, in a place of marvels and joy, that I learned about magic. I want to share the dreams of that little girl with you tonight." Adriana gestured dramatically toward the curtains. As they parted, a smoky, multicolored haze poured from the opening. More lights came up on stage, and the audience murmured appreciatively at the scene revealed. The set depicted a fanciful Arabian garden surrounded by domes and minarets. Colored fog a foot deep swirled around the floor of the stage. Above, a bright crescent moon shone in a sky filled with jewellike stars. Nancy was dazzled. As the violin played, Adriana began to dance. For a second she vanished behind a palm tree, and when she appeared again, she wore scarlet harem pants, a brocaded vest, and many swirling veils. The audience applauded at her remarkable transformation. Over the music came the sound of Adriana's voice, rich, full, hypnotic, no longer a whisper. "The girl dreamed that she was a princess, imprisoned in the garden of an evil wizard. She danced to soothe her loneliness. Her only companions were the creatures of her imagination." As she danced, she released several veils, one by one. Each of them swirled as it fell, then rose again, as if by itself. Soon there were four of these silk shadows dancing with her. "Are they real dancers or what?" Ned asked Nancy. "They couldn't be," Nancy whispered back, mesmerized. "But they sure look real. I wonder how she does it." "You guys," George scolded them. "Don't try to figure it out. You'll ruin it!" The music built to a crescendo, then suddenly stopped. Adriana froze in place. The dancing veils stopped, too, trembling a bit as Adriana frowned at them. "But these companions only reminded the princess that she was alone," she told the audience, then clapped her hands imperiously. As if following her command, the veils dropped to the floor. The audience applauded, enchanted by her showmanship. The music began again as Adriana said, "The princess knew she must escape the garden and venture out into the great world beyond. But how?" Adriana swirled around, and when she faced the audience again, she had a shiny brass lamp in one hand. Her face shone with joy and wonder. Nancy watched as Adriana rubbed the lantern and purple smoke began to pour from it, rising toward the ceiling in a dense column. Gradually the smoke took the shape of a huge genie looming over the magician. Adriana drew back in fear but then leaned forward as though listening as the genie spoke to her. "The genie promised the princess only one wish, but she knew at once what it must be. Something to take her away!" The genie bowed once to Adriana, then broke apart as though scattered by a breeze. The audience sat spellbound. Adriana turned her attention to the fog billowing around her feet. She began to wave her arms in front of her, and a Persian carpet rose out of the haze. Soon it floated four feet off the floor, undulating in response to Adriana's gestures. Nancy scanned the stage to see if she could figure out how the carpet was operated. She quickly gave up and let Adriana's magic work, her gaze riveted on the patterned rug as it dipped low for Adriana to leap onto it. It swooped high into the air, Adriana riding it like Aladdin! The audience gasped in amazement. "But the evil wizard would not let her escape so easily," Adriana went on. A dark figure in a black turban and robe appeared atop one of the minarets. He snapped his fingers, and a ring of fire formed in front of Adriana. The carpet hesitated in midair, then flew right through the fiery hoop. Adriana escaped! Still up in the air on the flying carpet, she laughed at the evil wizard, who stood shaking his fist at her. The audience laughed. "See?" Nancy whispered to Ned. "The way she went through the ring proves that there are no strings holding the carpet up!" Just then Nancy spotted several small tongues of flame licking at the back corner of the flying carpet. "Ned, George," Nancy said, her fear sounding an alarm. "Look!" "The carpet's on fire," George said, rising out of her seat. "That's not supposed to happen, is it?" Nancy clutched the arms of her chair. Someone at the back of the audience screamed. Startled, Adriana turned and saw the orange glow that had now engulfed the carpet's tassled fringe. Nancy could tell by the magician's expression that something terrible was happening. Adriana took a step toward the fire, raising her foot to stamp it out. Before she could move, though, the carpet erupted in flames!